Discover how to stay fueled for busy (and not so busy) days of touristing. Being a tourist can be hard work. And putting the right fuel in your tank to sustain you until lunchtime is one of the most important decisions of the day, right? Luckily for you, a great cup of coffee and a hearty breakfast is easy to find. There are lots of little joints specializing in that basic paper cup … but you’re on vacay and in no hurry, so why not check out a local coffee shop or café? Here, you’ll quickly discover that the fresh air on the Bruce awakens taste buds that crave something fresh and flavourful to get you started and on your way … whether it’s 7 am or noon. The Coffee Shop is located in Little Tub Harbour. Whether you stop in for your morning latte, or pop by for a light lunch, or an afternoon tea and fresh-baked muffin, this local coffee shop is a popular stop for both tourists and locals. The coffee shop serves quality, freshly ground brews, coffee specialty coffees and teas. Grab a breakfast sandwich or baked treat. The café offers free WIFI, but space is limited, and seating is at a premium. Closed in winter. Rachel’s really does offer something for everyone. The little blue house is also home to some of the best coffee and baked goods in Lion’s Head. If your timing is right, you’ll be hit by a waft of something delicious when you open the door. The bakery serves a changing variety of muffins, squares, breads, buns, pies and pastries plus organic fair trade coffee, Nespresso espressos and lattes to go. If you arrive hungry, and it’s noon, there are plenty of delicious menu items to satisfy, from salads and juicy burgers to soups and sandwiches with daily specials. While Northern Confections is well-known for its candy, those in the know frequent the coffee shop and café for organic fair trade coffees, delicious Bruce County homemade butter tarts, cinnamon buns, breakfast wraps, hamburgers and sandwiches. If coffee isn’t to everyone’s taste, there’s an extensive ice cream parlour and of course, everyone’s favourite … candy. Dine in and take out. A local hang out, The Green Door Café features the best farm to table ingredients prepared fresh every day with a menu that changes with the seasons. Breakfasts will make you want to linger with fresh coffees and teas at the ready. A warm greeting from owners quickly make you feel at home, like a local yourself. Enjoy comfort food at its finest but be sure to get a homemade butter tart to go. All full up and ready for a hike? 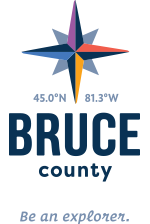 Here are the top Bruce Trail Hikes for the area. Ready for a lazy afternoon after being filled with so much good food? Beaches are only a few steps away!